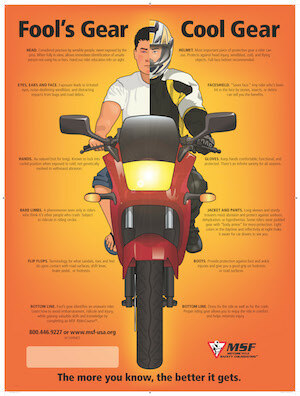 After strapping on your helmet, the next best protection you can have in case of a motorcycle accident is insurance. While all 50 states requireminimum insurance coverage to operate a motorcycle, be aware that the minimums may not adequately protect you in a serious accident. Like any type of insurance, how much you’ll need will depend on many different factors, including the type of bike you own, how often you ride, your marital status, your personal assets and your budget. Click to expand this Fool’s Gear, Cool Gear infographic. Never Drink and Drive – In 2013, 28 percent of cycling fatalitiesinvolved riders who were legally intoxicated.